Traveling in Italy is a feast for all your five senses. As I traveled by train from Milano to Modena I was hoping for something to catch my eye: rolling hills, mountains, something. I was a bit disappointed as the train traverse flat farmland and open grasslands. This area, Emilia Romagna, is much like the American Midwest. Not much in the way of topography but great for growing food. Emilia Romagna is the breadbasket of Italy. And I was going there to eat that bread and much more. Thanks to Emilia Delizia tours I spent a good portion of the day sampling foods that are famous and from Parma and Modena. Our tour guide and driver, Paulo was charming, kind and very informed. And handsome too by the way. Our first stop was at workplace of a local Parmesano Reggiano producer. This is no Kraft parmesan cheese mixed with woodchips people. 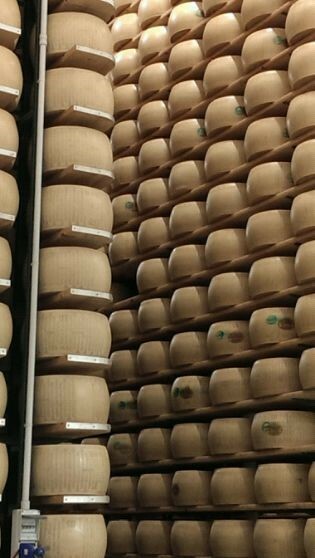 This is the real round and aged Parmesano Reggiano. Paulo explained how even the food of the special cows was local and regulated. The milk used to create the cheese had to be fresh daily. They are milked two hours after ingesting their local foodstuffs and are milked twice per day. 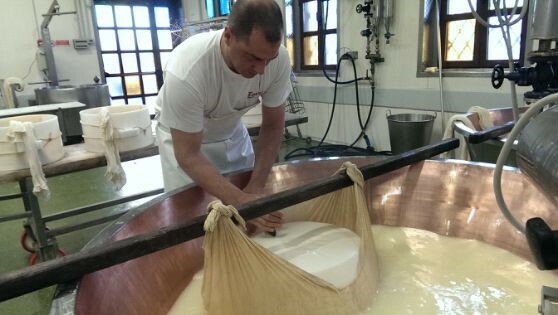 Did you know that it takes 550 litres of fresh milk to mak on wheel of Parmigiano Reggiano? And at least 12 months? Milk left overnight to separate the cream from the milk (cream is used to make ricotta and other things)The next morning the Skimmed Milk is poured into huge copper cauldrons and mixed with new cream where it is broken down into small pieces and cooked.Whey is added to the mixture by the cheese-maker.After turning off the heat, the heavy granules become a huge mass which sinks to the bottom. The massive clump of cheese is lifted out by two cheese-masters, divided into two pieces and placed into the cheese molds. 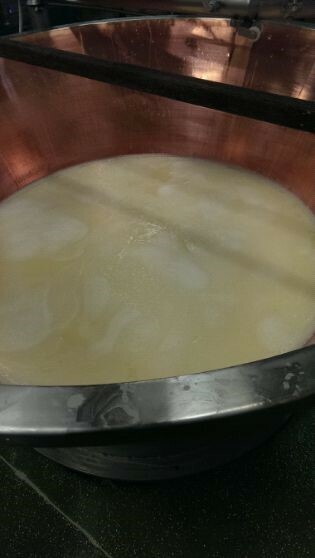 There are many other steps including resting the cheese, washing it in water with sea salt, testing it and marking it. Next it rests from 12 to 36 months or more. Now for the tasting: the 12 month is creamier on your tongue and this plus the 24 month old are often served sliced. The 36 month old is dryer and with a stronger, wonderful taste. This one is usually grated to be added to dishes. Even young babies are fed this cheese in a vegetable broth soon after they stop nursing or bottle feeding. Wow, I loved that tour and the cheese. Most of us bought some for ourselves. I will be eating it throughout my next few days. After the cheese fest, we moved onto Traditional Balsamic Vinegar tasting. I was really looking forward to this experience. The process for true Traditional Balsamic Vinegar to be ready for consumption takes at least 12 YEARS and the best takes 25 YEARS OR MORE! Paulo told us that traditionally families in this area would start a Balsamic Vinegar barrel for their new daughters in the January after their birth. They would work it until the daughter was to marry and it became a part of her dowry. I would have liked that as part of my dowry--wait I didn't have a dowry. Grapes are harvested and only squeezed 70% so as not to get the seeds and stems into the juices. After 2 years the liquid becomes a wine. Next it is placed in barrels that are labeled with the year and time. Each year more is added, much has evaporated and the process goes on and on. The tasting should never be done with a metal spoon as the acidic portion, although you can hardly taste it, is still there. The 12 year old balsamic still has that acidic flavor married with an unexpected sweetness. But my favorite is the 25+ year old balsamic--it is an explosion of sweetness and tanginess on your tongue. You even seem to breath it upwards into your nose as you savor the flavor. To be official, the balsamic must be tested, approved and stamped by the local consortium of specialists. 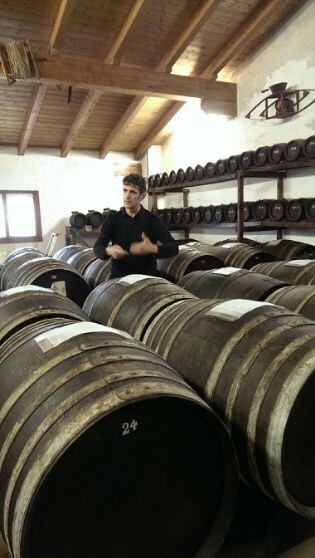 That is the only way you can know for certain that you have the REAL Balsamic Vinegar of Modena. It is worth the money. I wanted more for my strawberries and even for my gelato! Finally we visited the home of the MEAT MUSEUM. 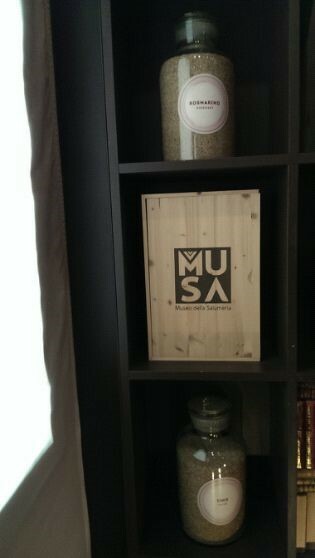 Yes there is a meat museum called MUSA (museum of salumi) by the Villani family who has been making salumi for 5 generations in this area. Salumi you ask? Salumi is the designation of all different kinds of meats whereas Salami is a specific type of meat product. We saw legs of pigs, salami, prosciutto, every kind of meat from a pig and some from beef that you can imagine. It as very educational but I wanted to taste it. We finally entered the butcher shop of the Villani family where all the locals were picking up their salumi for the day. We drank a bubbly red wine while tasting Parma ham (prociutto), Mortadella (the forerunner of our poor substitute of Bologna) and cotto salami. We were fighting over the meat itself and an extra tray was brought for us to enjoy. Personally in the USA I rarely eat cold cut meat. 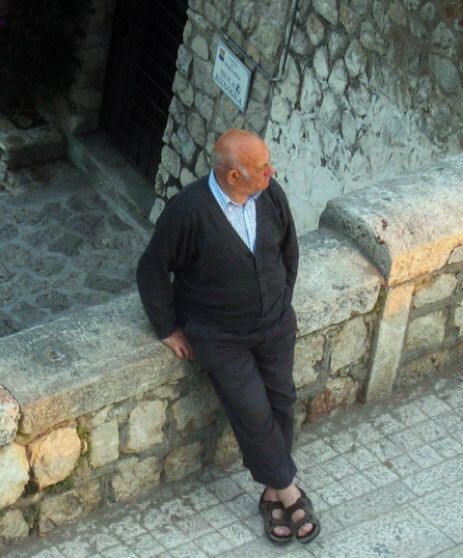 But here in Emilio Reggiano I cannot get enough. I have it for breakfast. I ate it here for lunch and I snacked on it for dinner. No preservatives, no additives, controlled production, happy pigs prior to their passing, precision handling. This is what MEAT should be. Yes, I had hoped to visit the Ferrari museum on this visit. I love Pavorotti and promised myself I would see his home and museum. There are three UNESCO sites in Modena I had wanted to explore. I did not make it to most of them. However, I achieved my primary goal: I wanted to eat the real thing in the real place of origin. 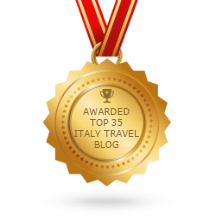 Thanks to Paolo and Emilia Delizia tours I did just that.